The Fosco Maraini Prize (Premio Fosco Maraini) was established by the Italian Cultural Institute (Istituto Italiano di Cultura=IIC, an organization of the Italian Ministry of Foreign Affairs) aiming to promote an understanding and interest in Italian culture. This time with the third ceremony, Dr. 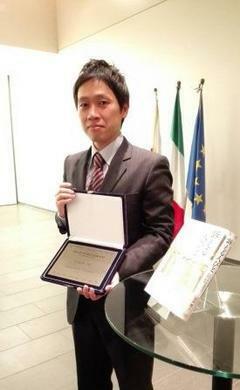 So Nakaya was awarded for his work "Petitioners: Justice and Politics in Medieval Italy". It was selected by the selection committee consisting of Prof. Tadahiko Wada, Prof. Osamu Nishitani, Prof. Shigetoshi Osano, and Ms. Mariko Ozaki, from among 150 to 200 excellent works published in 2 years from July 2015 to June 2017. His work was evaluated on possible impacts not only on the academic historical study but also widely on society and the fourth estate. The evaluation comments are as follows. "As the framework of modern institutions such as sovereign nations, nation-state is questioned variously in the present globalized world, the explication of the formation and transformation of the "Comune" shown in his book gives a rich suggestion to consider democracy and publicness in different ways from general political theory about the power and the government." 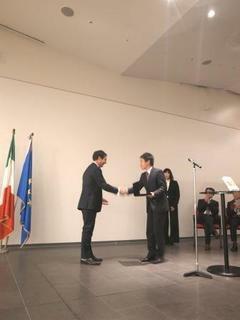 The award ceremony was held at the Italian Cultural Institute - Tokyo on 7 December 2017, and a memorial shield and an additional prize were awarded by Director Paolo Calvetti.